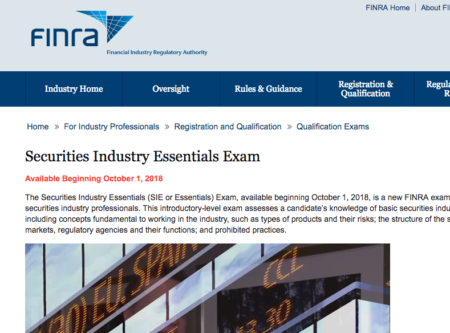 Beginning October 1, 2018, FINRA will overhaul the format of its regulatory exams: A new general knowledge exam called the Securities Industry Essentials (SIE) will become a corequisite for the Series 7 (General Securities Representative), Series 79 (Investment Banking Representative) and other Series Exams. The individual Series Exams will be trimmed down to focus on content specific to the roles relevant to those exams. FINRA is calling the individual Series Exams “top-offs” to the SIE. The previous FINRA format was often criticized for too much overlap of content across the individual Series exams, and finance professionals looking to remain in good standing found the need to take multiple Series exams inefficient and costly. The new format aims to fix these issues. Below is an overview of the topics (or, for an enthralling read, head to the FINRA site and download the full SIE content outline). Unlike the Series 7, Series 79 or any other Series Exam, you do not need to be sponsored by an employer to take the SIE. FINRA hopes this will encourage students and prospective finance professionals to gain an understanding of basic financial knowledge prior to employment. FINRA has priced the exam accordingly at $60. However, you still need employer sponsorship to take a top-off exam (Series 7, Series 79, Series 6, etc.). If you take the SIE and don’t find a job at a FINRA-member firm within 4 years, you’ll have to retake the exam. If you join a member firm but leave, as long as you return to a member firm within 4 years, you will not need to retake the SIE. The top-off tests expire two years after a professional leaves the industry. Should I take the SIE? We’ll refrain from a full assessment until the exam is administered. However, for those considering the SIE as a way to gain financial skills valued by employers, we are skeptical about its usefulness. That’s because unlike financial training that investment banks actively seek out for new hires, the Series exams are widely perceived by employers as irrelevant to a finance professional's day-to-day. FINRA has not yet administered the SIE, nor have they provided a passing score, so a full discussion on how to prepare is premature. However, we can see from FINRA's SIE content outline that there appears to be significant overlap with the previous Series 7. Given that the exam is far shorter and focuses on basic industry knowledge, we suspect it will basically be a Series 7 “light.” If that turns out to be the case, SIE exam prep will likely be a mercifully shorter version of Series 7 exam prep. 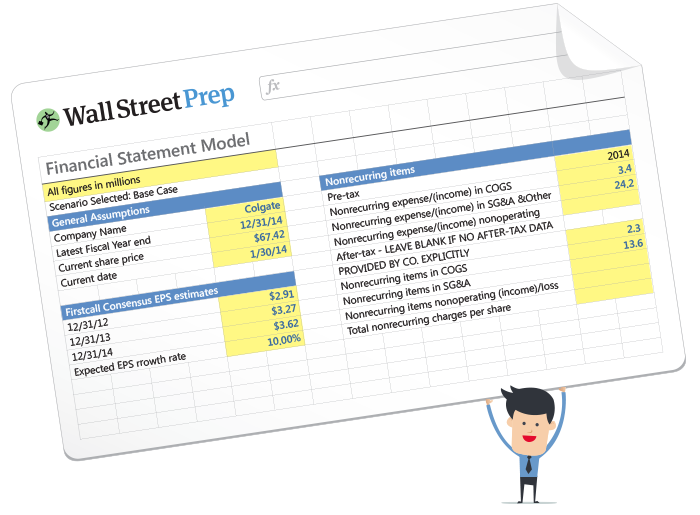 The Series 7 is the most widely administered FINRA exam. The pre-SIE Series 7 was a 6 hour, 250 multiple-choice question exam that covered general financial knowledge as well as product-specific knowledge. With the SIE, instead of just taking the Series 7, you will need to pass both the SIE and a new, shortened version of the Series 7. The Series 7 will now be 3 hours and 45 minutes long with 125 multiple choice questions. The new exam places greater focus on product-specific knowledge. Learn more about the Series 7. The Series 79 is the Series exam for investment banking professionals who exclusively engage in advisory services to corporations. Similar to the Series 7, it will be shortened and become a corequisite (“top off”) to the SIE. It will go from a 5-hour, 175 question multiple choice exam to a 2 hour, 30 minute exam with 75 multiple choice questions. Most states (including New York) require any professionals who carry the Series 7 and several other Series exams licenses to also pass the much easier and shorter Series 63 Uniform Securities Agent license (or the Series 65 or Series 66, depending on their roles). So an investment banker practicing in New York will likely need to take the SIE, the Series 79 (or Series 7) and the Series 63. Individuals who apply for registration as a representative prior to September 30, 2018, will be required to pass the current representative-level exam appropriate to that registration category, not the revised version. In addition, such individuals will not be required to pass the SIE in order to register as a representative. However, if such individuals fail to pass the current representative-level exam and the next eligibility date for retaking the exam is on or after October 1, 2018, they will be required to pass the SIE and the revised representative-level qualification exam in order to register as a representative. Such individuals may take the SIE and the revised representative-level exam at the next available date on or after October 1, 2018. These individuals would not have to wait the requisite period for retaking a failed exam because the SIE and the revised representative-level exams are different exams than the current representative-level exams. Below is FINRA’s breakdown of all the Series Exams that are becoming top-offs to the SIE. Not sure about the others but Kaplan study materials for the SIE have about zero to do with the actual test questions. There are a huge amount of topics and terms that aren’t touched in the Kaplan materials anywhere. Thanks for chiming in - appreciate it! Who you think has the best study material to pass the SIE? I'm getting ready to start studying for the exam but I'm not sure where I should get this material. We at Wall Street Prep are hesitant to mention study materials as it could appear to be a recommendation. However, we will let others chime in on this. Join the discussion...Hi Yvette: I see a few of us found about this nw SIE test around the same time. My computer told me in January 2019 also. I just pick a book on Amazon that mentioned study guide. Also, I found a testing center close by. I am so excited that this has gone through. It was to hard to think a person has to work and pass the series tests. Do you have any recommendation for study materials for the SIE? Where do candidates get the study guide/books to prepare for the SIE exam? Is there an exact date for the first round of SIE testings? I think these can be scheduled on a regular basis, and that they are pretty frequently offered. To add to Haseeb's comment, the SIE officially starts October 1. If you registered before then, you would just take the series 7 (or whatever relevant exam you're looking at). If you register on after October 1, you have to take the SIE + the new abridged "top off" version of whatever Series exam you're taking.